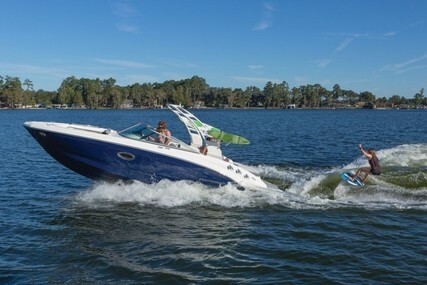 Chaparral Boats are the top manufacturers of 18-35-foot sterndrive powerboats in the USA and has been building quality family boats since 1965. Chaparral Boats was founded in Ft. Lauderdale, Florida; by William “Buck” Pegg and was originally named Fibreglass Fabricators. Its main focus is on meeting the growing needs of discriminating recreational boaters, producing recreational and fishing boats. The skilled craftsmen building high-quality boats by hand is still a process at Chaparral Boats. At Chaparral, there are many builders who are second and third generation boat builders and they take personal pride in every boat that they build. 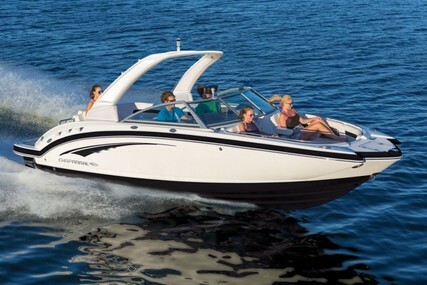 Chaparral Boats are valued for its versatility and innovation. Chaparral Boats is the world's leading manufacturer of quality fiberglass boats. It incorporates the design, quality construction, and innovation and couples it with proven performance and gives the ultimate boating experience. Chaparral has put together the knowledge they learned about boat building in the last 50 years into all the boats that they built. And the end result is, a family jet boat that's priced right, built right and is perfect for you. Your weekends on the water will never be the same as Chaparral brings a whole new look with more seating capacity, storage space, luxury, quality, and performance. There are over 100's of Chaparral boats for sale listed at www.rightboat.com and own your Chaparral soon. 1. Who is the founder of Chaparral and when was it founded? Chaparral was founded by William “Buck” Pegg in the year 1965. 2. Where is the Headquarters of Chaparral located? The Chaparral headquarters is in Nashville, Georgia, United States of America. 3. What is the Chaparral Vortex range? The Chaparral Vortex range is unique in every way, a sleek, classy profile with dry-riding freeboard and a whole new level of innovation. It is designed with innovative styling and an unmatched quality. If you are on a long-distance cruise then its enclosed head is a welcome plus. 203 Vortex VR - 20' 3"
203 Vortex VRX - 20' 3"
223 Vortex VR - 22' 3"
223 Vortex VRX - 22' 3"
243 Vortex VR - 24' 3"
243 Vortex VRX - 24' 3"
2430 Vortex VR - 24' 3"
2430 Vortex VRX - 24' 3"
4. What is the Chaparral H2O range? The Chaparral H2O range is very exceptional and its value joins quality and style. Specialized craftsmanship, time-tested manufacturing, and detail rigging deliver years of trouble free fun. Chaparral's wildly popular H2O series becomes the talk of the waterways, as it gets bigger and better with each of its amazing variants. 19 H2O Sport - 19' 4"
19 H2O Ski & Fish - 19' 4"
21 H2O Sport OB - 21' 6"
21 H2O Ski & Fish OB - 21' 6"
5. What is the Chaparral SSI range? The Chaparral SSI is the perfect family bowrider. It has engine options from 280 to 350 horsepower that lets the family enjoy the freedom to go-anywhere and do-anything. It is a family bowrider that is responsive and efficient. 246 SSI - 24' 6". 6. What is the Chaparral SSX range? The Chaparral SSX range packs more elegance, performance, and innovation. SSX is at its very best with the style lines, attention to detail and efficient use of space. SSX is a trendsetter in design, performance, and function as it glides through the water with minimal noise. 257 SSX - 25' 6"
267 SSX - 27' 0"
287 SSX - 29' 0"
307 SSX - 30' 6"
337 SSX - 33' 6"
7. What is the Chaparral Sunesta range? The Chaparral Sunesta range is best known for its performance and features. It is the perfect mix of innovative styling and performance and is more luxurious than rival deck boats. It is also spacious than its competitive conventional bowriders. 224 Sunesta - 22' 4"
244 Sunesta - 24' 4"
264 Sunesta - 26' 4"
8. What is the Chaparral Signature range? 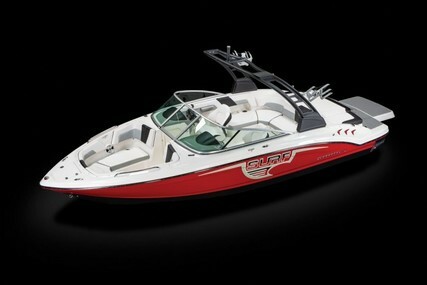 The Chaparral Signature range has its boats offering crisp acceleration, tracks true and is dry riding in big water. The design excellence shines through with a standard fiberglass hard top that creates a big cruiser feel and protects in all-weather condition. The Chaparral Signature look is bold and innovative. 330 Signature - 33' 6"
9. What is the Chaparral SunCoast range? The Chaparral SunCoast range is a blend of style and quality. 191 SunCoast - 20' 0"
210 SunCoast - 20' 10"
23 SunCoast - 22' 10"
250 SunCoast - 24' 10"
10. What is the Chaparral Surf range? The Chaparral Surf range equals to speed, thrills and excitement. 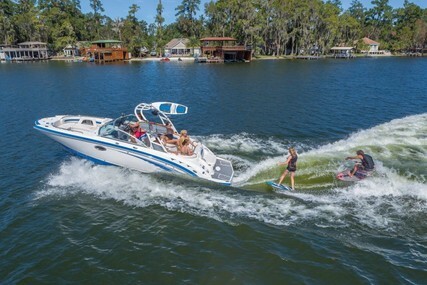 The newest addition delivers adventure in style making wakesurfing more thrilling and easy to enjoy than ever. 227 Surf SSX - 23' 0"
257 Surf SSX - 25' 6"
246 Surf SSi - 24' 6"
244 Surf Sunesta - 24' 4"
264 Surf Sunesta - 26' 4"